As a whole, I thought it was one of the better WrestleManias of recent years. Admittedly, the build-up could have used some extra work (as was the case for the past few years), but in terms of execution, it was probably one of the most consistent WrestleManias I can recall. I don’t think there were any matches that will go down as classics (which is, quite worryingly, a trend of the past few Manias), but there was also nothing really bad about it. There were no duds, and that’s always a bonus. First we had the pre-show, which consisted of the Cruiserweight Championship match between Nevill and Austin Ares, as well as the Andre the Giant Memorial Battle Royal and the Intercontinental Championship match between Dean Ambrose and Baron Corbin. The cruiserweight match was fifteen minutes of great ring work, and a real shame it didn’t make it on the main show (though at least in these days of the WWE Network where people can actually watch the pre-show at home, it doesn’t feel too far removed from being part of the event. Unlike a few years ago when pre-show matches were just a throwaway bonus feature on the DVD). Neville retained, which was only slightly surprising, but seeing as he’s one of the best heels (“bad guys” for my non-wrestling fan readers) the company has right now, it makes sense for his run to continue a bit longer. The Andre the Giant battle royal was won by Mojo Rawley. Well, it was a surprising victory – though one that only seemed to happen to get some mainstream coverage, as Rawley was aided by who I presume is a famous athlete (sorry, I’m not sports savvy) – but I really have to wonder where they’re going with this. This was the fourth annual AtGMBR (ugh, that acronym), and WWE really hasn’t known how to properly utilize the match. The first winner, Cesaro (one of the most talented wrestlers in the company) didn’t benefit from it. The Big Show, the event’s second winner, didn’t gain anything from it. Last year’s winner, Baron Corbin, actually got a pretty noteworthy push out of it, and it finally looked like WWE might get this battle royal right. But now, we have a winner who really hasn’t done anything too noteworthy in the company up to this point. So unless they actually elevate Mojo Rawley from this, I think it’s best if they drop the Andre the Giant battle royal concept next year. On a side note, poor Braun Strowman. Mere weeks ago, he was an unstoppable monster who was treated like a big deal. Then they give him one loss, and he’s relegated to a pre-show battle royal where he gets eliminated almost immediately. The Intercontinental Championship match was alright. Nothing great, and Ambrose and Corbin could definitely do better. But they were only given so much time on the pre-show. In the end, Dean Ambrose retained the title, which I guess makes sense right now. If you’re going to give Corbin a big win with his first championship, it probably should be on a higher place on the card. Then WrestleMania “officially” began with the much-chagrinned match-up between AJ Styles (one of the best wrestlers on the planet) and Shane McMahon (WWE authority figure and on-air personality who occasionally wrestles). Everyone, including myself, thought this match was beneath AJ Styles, who could easily steal the show if given the right opponent. But it actually ended up being a pretty fun match. Yeah, AJ Styles could have had a better opponent, but both men still gave it their all and delivered one of the better matches of the show. AJ Styles won (thank God), but Shane McMahon put on a surprisingly good showing (including performing a Shooting Star Press, of all things). The “second” match on the show was Chris Jericho defending the United States Championship against Kevin Owens, in what probably had the best build-up to any match on the show. It was a technically great match, as you would expect from two wrestlers with the talent of Jericho and Owens. But it probably could have gone on for a few minutes longer, and also should have been higher up on the card. Kevin Owens won the match after powerbombing Jericho against the side of the ring. The third official match pitted Bayley defending the RAW Women’s Championship against Charlotte Flair, Sasha Banks and Nia Jax in an elimination match. The ring work was definitely well executed, and the match definitely had some highlights (like Bayley, Sasha and Charlotte all teaming up to power bomb and pin the much larger Nia Jax), but the match ultimately suffered from a short time limit and questionable build-up. The match was about thirteen minutes, which would have been decent for a one-on-one contest, but a four-way elimination definitely needed more time. The match ended with Bayley retaining the title after last eliminating Charlotte, but the problem is that, story-wise, Bayley should have won the title here, instead of this being a title defense. WWE loves to tout the “WrestleMania moments” that their biggest show provides, but WWE seemed to actively remove the impact of this particular moment in the weeks leading up to WrestleMania. Bayley is a fan favorite, and Charlotte was “undefeated in pay-per-view title matches” just a month ago. But then they had Bayley beat Charlotte for the title on a random episode of Monday Night RAW, and then had Bayley end Charlotte’s PPV streak on last month’s throwaway Fastlane pay-per-view. And it would be one thing if all this happened months and months ago, with WWE not being able to stretch out these storylines to WrestleMania. But it all happened last month. If you’re that close to the biggest show of the year, why wouldn’t you save all the big aspects of this match for the biggest show? Anyway, the next match was scheduled to be a three-way tag team ladder match for the RAW Tag Team Championship between champs Luke Gallows & Carl Anderson facing the teams of Enzo Amore and Big Cass, and Sheamus and Cesaro. 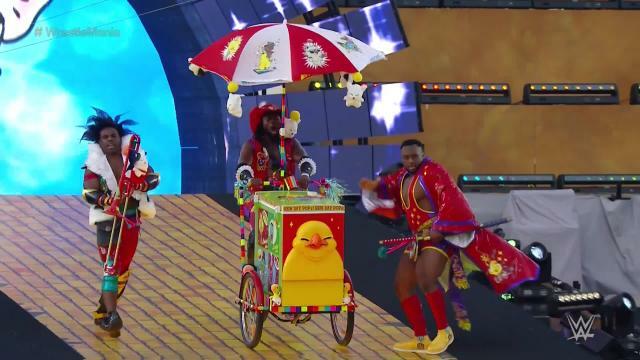 Before the match, WrestleMania 33 hosts the New Day (who were decked out as Final Fantasy characters) announced a fourth team was added to the match, who ended up being the Hardy Boyz. The Hardy Boyz won, of course, which might be the boost WWE’s tag team division desperately needs right now. The match was fine, with some fun ladder spots, but again, it was just too short (it barely exceeded ten minutes). WWE dropped hints that Matt Hardy is keeping his “Broken” gimmick that he’s developed since being away from the company, and one can only hope WWE continues to let him run with it. Next up was the mixed tag team match between John Cena and girlfriend Nikki Bella against villainous married couple the Miz and Maryse. The story behind the match was kind of goofy going in, but Miz and Maryse managed to make it entertaining, and Cena got some great promos out of it. The match itself was basic. Nothing great, nothing horrible. It ended with Cena and Nikki Bella simultaneously pinning Miz and Maryse (probably not the best ending, since Cena and Bella are reportedly taking a hiatus after this, Miz and Maryse probably needed the win more). 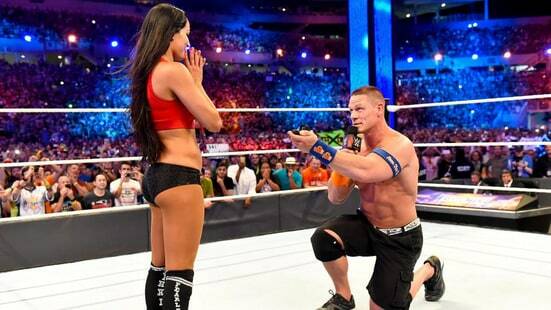 After the match, of course, came the moment most people expected, and John Cena proposed to Nikki Bella. Yeah, sure, the moment came off as a little forced and cheesy, but it was sweet in its own way. Maybe not my cup of tea, but who am I to boo a marriage proposal? Even if it’s a televised version of one (hopefully they had a more sincere proposal in private). Next we had the long-awaited match-up between Seth Rollins and Triple H, a match that was originally supposed to happen at last year’s WrestleMania, before Seth Rollin’s injury overhauled the entire show’s plans. With over a year of build-up, this one arguably had the best story going into the show (except perhaps Owens and Jericho, which probably had the better overall execution). The downside here is that the rivalry wasn’t allowed to reach its full potential, seeing as Seth Rollins received another injury a few months back that almost cost him a second consecutive WrestleMania appearance. Thankfully, he was able to make the show, but obviously, when the match was in doubt, it was difficult for them to hype it too much, and only in the last couple of weeks did it really start to liven up again. I actually really enjoyed this match. I’ve read some mixed reactions on it, since Seth Rollins continued to do some of his top-rope maneuvers, despite his injured knee playing a role in the story. But I actually felt that, in its own way, it added to the drama. Seth Rollins was so hellbent on getting revenge on his mentor who betrayed him, that he was willing to risk further injury if it would also keep Triple H down. In the end, Seth Rollins got the deserved win, and in the process feels like he’s finally transitioned to a proper star and babyface. Then we hit what had to be the low point of the show: Bray Wyatt vs. Randy Orton for Wyatt’s WWE Championship. This was a rivalry that had some good potential, but ended up being a huge mess. Wyatt is a creepy cult leader of sorts, and Orton joined his cabal last Summer. In January, Orton won the Royal Rumble, ensuring a world title opportunity at WrestleMania, and in February, Bray Wyatt won the WWE Championship. From there, it became obvious that this was going to be a story of Orton betraying Wyatt from the inside, and it would become mentor versus student. 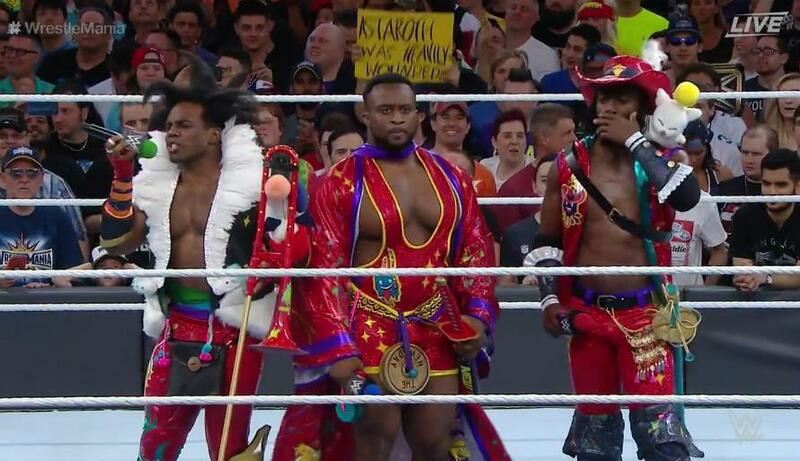 Geez, I know wrestling is all about suspension of belief, and they’ve done weird, mystical storylines in the past (even featuring Wyatt), but for this to be such a high-profile match, being for WWE’s original world title at WrestleMania, just felt so goofy. Worse still, I honestly don’t know who we were supposed to cheer for. Granted, the line between babyfaces and heels is often blurred these days, but when one participant is an evil cult leader, and the other is an insane arsonist who burns down a man’s house (even if the man in question is a villain), what exactly is the audience supposed to think or feel going into this? Anyway, the match itself was okay. Not bad, but nothing that screamed “WrestleMania world title match” either. The big gimmick here is that Bray Wyatt apparently used special effects powers so that the ring would be surrounded with stock footage of larva, worms and cockroaches. Admittedly, it was a decent effect the first time (the crowd even chanted “that was creepy”), but the repeated usage just turned it into something silly. I mean, is that seriously all Bray Wyatt’s new powers are? He can turn the ring into a tribute to Fear Factor? What really killed this whole deal, however, is that Randy Orton won. Orton, who was already a twelve-time world champion, really didn’t need this. Bray Wyatt, on the other hand, was only a little over a month in his first WWE title reign, has yet to win a WrestleMania match, and has for years been the centerpiece of WWE’s criticisms of bad booking decisions (Wyatt could have been the next Undertaker, but the writers and bookers never seem to have sustained interest in him keeping momentum, leading him to losing most big rivalries he’s involved in). This just ended up feeling like another bad booking decision in regards to Bray Wyatt. Not to mention Orton hasn’t really changed his character or moveset in about a decade, so it makes it really hard to care much about him winning a title these days. Next up was WWE’s other world title match, pitting champion Goldberg against Brock Lesnar it what was to be the two’s final showdown together. The match itself was only about five minutes, which under any other circumstance would be a downer. But because both men are more like special blockbuster attractions than traditional wrestlers (not to mention Goldberg’s age), this played to their benefit. The match really only consisted of four different moves (spears and jackhammers from Goldberg, and German suplexes and F-5s from Lesnar). So it was no technical marvel, but it worked as the hard hitting, titan vs. titan setup it was billed to be. Lesnar won the match and the title, which was expected, but a little sour for me, since I’ve never been much of a Lesnar fan, and I enjoyed the idea that Goldberg was the one guy Lesnar couldn’t beat. Perhaps what’s weirder than anything is how the commentators almost built Lesnar up as some kind of conquering hero. I mean, sure, he’s popular, but he was blatantly the bad guy in this rivalry (Goldberg returned to the ring so his son could watch him wrestle, and would hold his Universal Championship up to handicapped children in the crowds, while Lesnar would quietly remarked how he likes to hurt people. Certainly no shades of grey in this scenario). It’s one things for the fans to cheer bad guys if they like them, because they aren’t part of the story. But shouldn’t the commentators be more bummed that the blatant villain triumphed over the hero? Next up we had the Smackdown Women’s Championship match, which was originally scheduled for the pre-show, but fan outcry lead to it getting placed on the main card. On the plus side, it was on the main card. On the down side, it was a slightly over five minute bout that served as something of a bathroom break between the big matches. Now the match itself was fine. Champion Alexa Bliss was defending against Becky Lynch, Carmella, Natalya, Mickie James and Naomi, who returned from an injury that was initially thought to keep her off WrestleMania. Again, the match was fine, with each woman hitting signature moves and some decent spots. But two things really held it back. One of them was the extremely short time limit, which I mentioned. But the other was – much like the RAW women’s match – the potential surprises were ruined before the show. Naomi won the match and the title, which she had to forfeit about a month ago due to the aforementioned injury. WrestleMania took place in Naomi’s home town of Orlando, Florida. So obviously the story was her coming back and becoming a hometown hero. Except, WWE felt the need to announce Naomi’s participation on the episode of Smackdown before WrestleMania. Now, wouldn’t it have been a more crowd-pleasing moment to keep her quick return from injury a surprise, and have her come out as a bonus entrant in the match and come out on top? Finally, we had the main event between arguably WWE’s greatest legend, the Undertaker, facing off against the nobody-likes-him-but-they’ll-push-him-to-the-moon-anyway Roman Reigns. There was a lot of speculation that this would be the Undertaker’s last match, but that’s been speculated about Undertaker’s WrestleMania appearances for a few years now (like his classic “End of an Era” Hell in a Cell match against Triple H at Mania 28, or his match with Brock Lesnar at Mania 30, which resulted in the end of Undertaker’s undefeated winning streak at Wrestlemania). Before the match began, it became apparent that this time, it really was the end. WWE announcer Jim Ross (the most acclaimed color commentator in the company’s history) returned after years away from the company to call the match, and the fact that this match was getting the main event slot after the world title matches almost spelled it out (the Goldberg/Lesnar match had more proper build-up, since Undertaker and Reigns rivalry of “whose yard” WWE was made it sound like a scuffle between Hank Hill and a Hobbit). This was the Undertaker’s exist. As for the match itself, like a number of other matches on the show, it was fine, but Undertaker probably deserved a more memorable in-ring sendoff. It was fun whenever Undertaker and Reigns hit their big moves and kept kicking out, but there were some notable botches (especially Roman Reigns’ failed attempt at hitting Undertaker with his own finisher, the Tombstone Piledriver). The match ended in appropriately dramatic fashion, with Undertaker receiving finisher after finisher and not letting up, only losing when his body couldn’t take anymore. They definitely tried to replicate the impact of when Undertaker retired Shawn Michaels seven years ago at WrestleMania, with the victor reluctant to send their opponent into retirement. There was, however, a big problem in this instance. When it was Undertaker retiring Shawn Michaels, both were respected legends, and Undertaker played the part of reluctant destroyer just as well as Michaels played the role of defiant hero. Here, we had a respected legend going out to a guy who, while talented, has been forced upon audiences to such a degree that it’s completely turned fans against him, and didn’t play the part of a man regrettably retiring a legend too well at all (his usual, cocky attitude was present, with only a hint of remorse). Granted, there aren’t a whole lot of wrestlers with the credibility to send Undertaker into retirement on the roster anymore, with John Cena and Triple H being the only ones who come to mind (in the case of the former, a planned match was apparently scrapped, while in the case of the latter, Undertaker has already bested him three times at Mania). It was also weird to see Undertaker lose a second WrestleMania match, as his fabled “Streak” was alive and well just a few short years ago. Really, the only way this scenario would have felt right is if Roman Reigns had gone full heel in order to retire Undertaker. Reigns gets boo’ed all the time anyway, and now that he’s retired Undertaker, why in the world would anyone cheer for him now? So perhaps it wasn’t the ideal way for Undertaker to go out, but the events after the match were among the rare instances when wrestling can actually get touching. As Undertaker was about to leave the ring, possibly to return another day, he rethought it, went back into the ring. He removed his iconic gloves, coat and hat, and laid them in the middle of the ring. In an unprecedented moment of the Undertaker breaking character, he kissed his wife in the audience, and when he made his way back up the ramp, he did his iconic pose as he lowered into the ground. It was the most melancholic moment in WrestleMania history. More so than Ric Flair or shawn Michaels’ exists. It was genuinely sad. I mean, to put things into perspective, I was only one year old when Mark Callaway debuted his Undertaker character in WWE in 1990. He’s had the longest and most noteworthy career in WWE’s history. He’s had many classic matches, and despite the sheer absurdity of his “dead man” gimmick, he did it so well it easily stands as the best gimmick in pro wrestling history. Simply put, seeing the Undertaker walk away is almost surreal, even if his age and years of injuries meant we all suspected his retirement for some time. He may not have had the final match he deserved, nor a worthy final opponent, but man, what a sendoff. 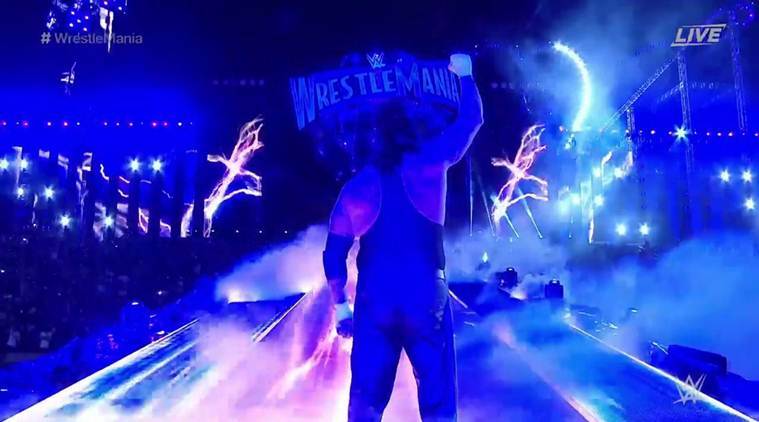 In the end, WrestleMania 33 was a consistently good show – easily better than last year’s stinker that was WrestleMania 32 – but, like WrestleMania 31, it was void of having a truly classic match, despite its consistent quality. Still, it provided a lot of fun for fans of all types: We got some good in-ring work from the likes of AJ Styles, Kevin Owens and Chris Jericho. We got lots of mayhem with the ladder match and Seth Rollins vs. Triple H. And we got a brief but satisfying blockbuster battle between Goldberg and Brock Lesnar. What any fan will most remember from the even, however, is its bitter ending. Seeing a performer as iconic as the Undertaker finally walking away (breaking character in the process) was a powerful enough moment to keep it all afloat amid some odd booking and storytelling decisions. Anyway, hope you enjoyed what I had to say about WrestleMania 33. I know it’s a bit different from what I usually write, but I figured I’d give it a shot. I’m not sure if I’ll be doing this kind of thing again. Maybe with WWE’s other big pay-per-views like SummerSlam or the Royal Rumble (let’s not pretend that Survivor Series is still in that same boat). I’m not sure. Oh well, if you like wrestling, maybe you’re interested in what I have to say. If you don’t like it, hopefully you don’t think any less of me for finding enjoyment in it.